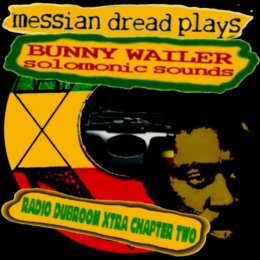 WWW, July 2014 - In the second chapter of Radio Dubroom Extra, Messian Dread plays some of his favorite Bunny Wailer tracks plus two relatively rare selections from Jah Bunny's Solomonic Sounds label. Some tracks from Dubd'sco, Rock 'n' Groove, Gumption and Rule Dance Hall plus an alternative version of Rise and Shine as well as some 12" and 7" versions. Cool Runnings! Bunny wailer is a favorite singer of the Dubroom's webmaster even though his favorite tunes are not the ones generally considered his best. Where many love Bunny Wailer's Roots Rock a' la "In I Father's House", Messian Dread prefers the more dubby parts captured on one of his favorite albums: Rock 'n' Groove. No surprise this mix features a couple of tracks from that album. There's also a healthy portion of relatively unknown tracks by Jah Bunny and a couple of selections from his albums Gumption and Rule Dance Hall.